Today I've found a little toy for you and your dog that is totally hilarious. Just check the picture. 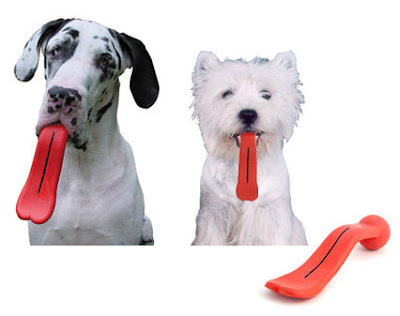 The Humunga Tongue is basically a nontoxic rubber piece with language form. One of its ends becomes a ball, place by which your dog will tend to bite and to gather the toy leaving the language to the outside. The rubber is tremendously resistant reason why it will hold pulls and bites very well. In addition you will be able to choose as large as between two different measures depending your mascot. If you want one you can purchase it from here with 18.49€ .